I obviously keep a few notes of all the stuff that happens each day in a notebook (pen and paper type notebook not the Apple iBook type) and then update this blog when I find an internet cafe. When I read back the amount of stuff that can happen some days is fn amazng, this day was one of those. First thing I dd was go to the insurance office and met a girl named Jenni there who helped me out heaps. She rang around and found out that I needed to go to the customs office in Hamina to get the green crd insurance I needed for motoring on European roads. She gave m some directions and I wondered back to the hotel to pack up my stuff ad ride down there. As soon as I arrved in Finland I had started seeing motorbikes on the road, but as I crossed the raod from the insurance office anew CBR 1000 tore past (it's fatster than most Ferarri for the car lovers). It was still pretty cold with a bit of rain and having been continually told in Russia that I was crazy to be riding at this time year here was a bloke wheel spinning a bike up the road that most people are scared to ride on perfect summers day.... I was waiting for some Finn to pull up next to me and call me soft on the way to the customs office. As normal the customs office was very helpful and sold me some insurance to keep me out of trouble, they also stamped the Carnet that should of been done at the border by my way too relaxed Customs mate. Kind of lucky (still don't beleive in luck though) because trying to get out of a country when you havn't been stamped in is pretty fn hard I reckon. 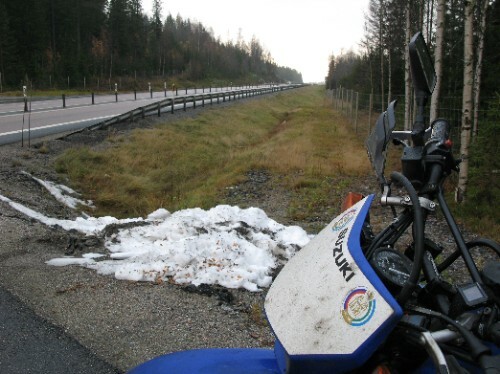 I left there and cruised down the road to Helsinki, perfect road (of course) with a little bit of rain just to keep me excited (I STILL love riding in the rain, was hoping this trip mightfix my fasination with wet roads... maybe up north in the ice). As I was wonderin how the f I would find somewhere to sleep here I flew past a sign that pointed the wayto "Rastila Camping". I've been to Helsinki before for those that don''t know in a previous adventure (I'll write a book on that one next year) where I had stayed at this camping ground. So, just follow the signs. Problem is that I missed one and therefore missed the turn and endedup out the front of a very big motorbike shop. Pretty handy when both the tyres on your bike should of been changed about 1000km ago. Wondered into the bike hop and ordered some Metzeler Enduro 3's and cruised back to find the turn that I missed. Booked a cabin at Rastila camping and sent atext message to my old mate Carita. When I finally write the book about my last adventure, you will all then know that I spent the first part of it on a small island in Denmark picking strawberry's. Thats where I met Carita and Emma, my Finnish sisters, who don't half love a party. Unforunantly Emma was across in Scotland this time, but has mentioned about visiting her there....hope you have good drinking shoes over there Em. Anyway Carita has never benn not up for a beer. Carita is the somewhat infamous girl that beat me in a centrian (drinking game that involves 100 shots of beer in 100 minutes)cracking out a pretty impresive 96 compared to my 93. That was three years ago and she assured me she hadbeen practicing. Oh no.